Update your workspace or home office with the Rochelle Office Chair Grey, a modern design that brings style and practicality to your interior. The Rochelle is a wonderful contemporary piece that also brings comfort wherever you choose to use it. 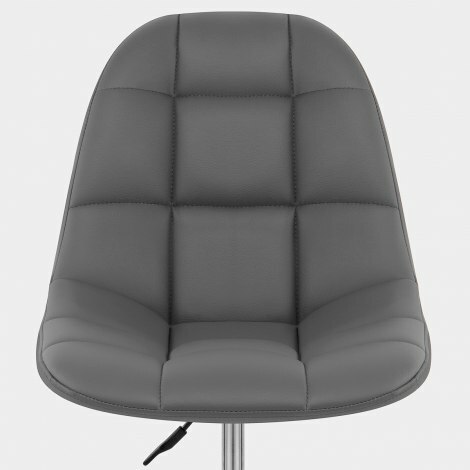 Upholstered in minimalist grey faux leather, the stylish seat and supportive backrest are generously padded and enhanced with trendy grid stitching. Providing fabulous functionality, the polished chrome central column houses a gas lift mechanism for variable height as well as 360 swivel. Easy to use, they work alongside the five spoke roller base to deliver optimum mobility. With contrasting black nylon castors, the Rochelle is a chic modern design that really does have it all. "Impressed with quality, price and delivery service"
Nice chair, a little darker in colour than I expected but looks good. Comfy and slides around on my laminate floor well! Received this chair the day after I ordered it.. So fantastic service. Lovely quality chair very comfortable and looks stylish and expensive. Would definitely recommend this company and this chair. Fast delivery, great value, easy to assemble. To top it off, fantastic quality. Very pleased with this all-star service. Excellent service, delivery and quality of this firm and this chair. Fast delivery and excellent quality product. Very pleased with this purchase.